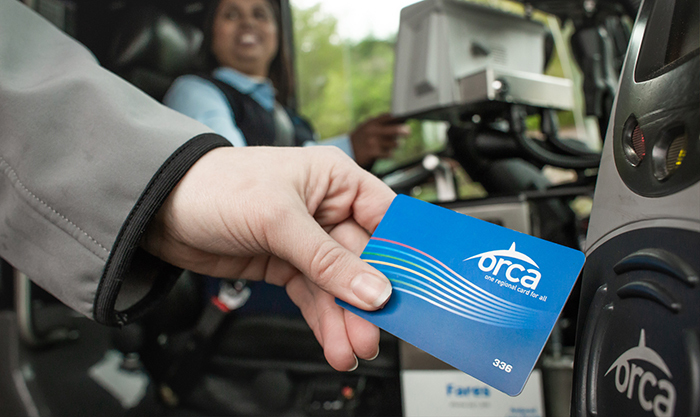 The low-income fare would be instituted through the ORCA LIFT program, utilizing the regional electronic fare card, ORCA. Photo courtesy of Community Transit. From a Community Transit news release, February 7, 2019. Community Transit is proposing to adopt a reduced bus fare category for eligible low-income residents. The new fare would be half the price of a regular adult fare and would go into effect on July 1st, 2019. Details on income verification and eligibility are yet to be worked out. Community Transit bus fares. Image courtesy of Community Transit. Phone: (425) 353-7433 or (800) 562-1375. The public is invited to ask questions about the low-income fare proposal by joining Community Transit Live webcasts at Noon on Tuesday, February 12th; and Tuesday, March 5th, on the Community Transit Facebook page. A public hearing before the Community Transit Board of Directors will be held at 3:00 pm on Thursday, March 7th, in the Community Transit Corporate Board Room, 7100 Hardeson Rd., Everett, accessible by Everett Transit Route 8 and Community Transit Route 105. Community Transit is responsible for providing bus and paratransit service, vanpool and alternative commute options in Snohomish County. The agency is building a network of Swift bus rapid transit lines with Swift Blue Line along Highway 99 and the Swift Green Line between Canyon Park/Bothell and Boeing/Paine Field opening on March 24th.